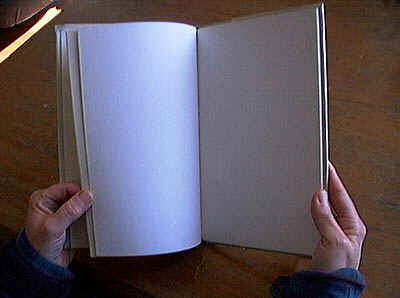 The official baseball rule book is well over a hundred pages long. And that doesn’t even get into the numerous unwritten rules that govern the game. Some of these shadow regulation that have been passed down the baseball generations are rules of etiquette, and others are rules of strategy. 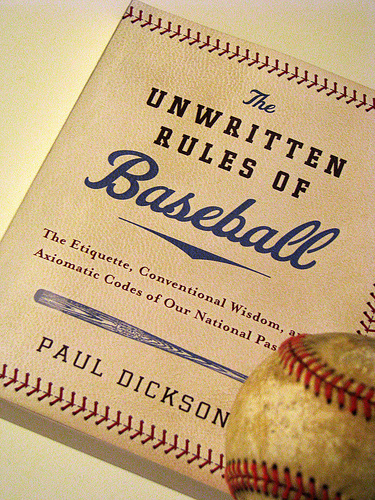 We have a rundown of all the important unwritten rules of baseball below. This superstition may be baseball’s most famous unwritten rule because it also applies to broadcasters and even fans. While talking about a no-hitter will get you dirty looks, bunting during one will get you fastball under the chin. That’s just rubbing it in. However the definition of “way ahead” has changed since this rule developed, in the deadball era. While back then it would be improper to steal when ahead by more than a couple, these days you wouldn’t be in trouble until you’re up by at least five. Since there isn’t much difference between being on first and second (or second and third) when your team is down big, running in that situation makes you an unserious stat-padder. Everybody just wants to go home. There’s no etiquette behind this one. Instead, it’s because there are far fewer advantages to being on third, rather than second, with two outs as there are with no or one out. And by stealing with two outs you risk taking the bat out of the hitter’s hand and ending the inning,. However there are some still some advantages — particularly as team’s get more aggressive with outfield alignments — so you see this happen more and more. 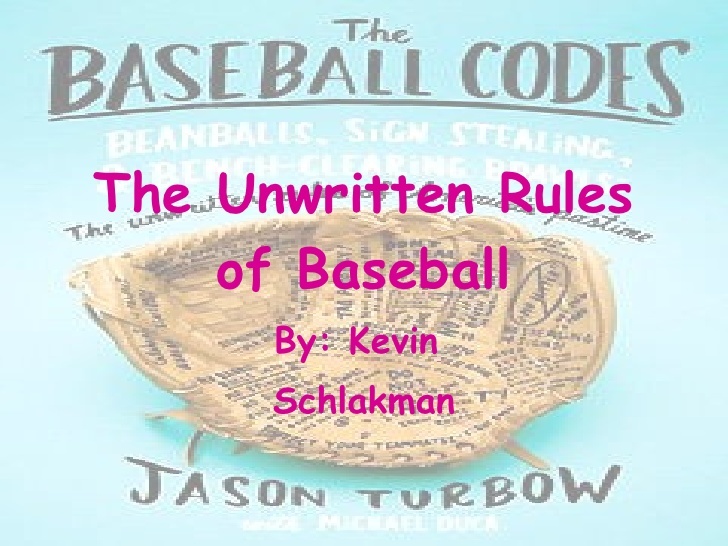 This one famously caused a kerfuffle between Alex Rodriguez and Dallas Braden and afterward A-rod claimed he didn’t know it was an unwritten rule. A sliding scale here. What would count as not admiring a home run in 2013 would have probably caused a bench clearing brawl in 1950. Yes, pitchers are delicate flowers. Hitters can be delicate flowers, too. Because if you clear first base the other team is likely going to take the bat out of his hands by walking him. Because they are different skills. Actually, some would argue since hitters make their worst contact down 0-2 this is the best time to hit and run. The counter would be you don’t want to force a hitter into swinging when he has two strikes on him. Because the first step to a comeback is just getting on base. This eye-for-an-eye code is more costly now that there are warnings and automatic ejections. The home team always has the advantage during a tie game because they get the last at-bat, and when the home team is playing for one it also means they have at least one more out than the visitors. The best revenge is living well. Or at least pretending that 95 MPH fastball to the forearm didn’t hurt. A pitcher’s body language is very important when a fielder flubs a play. If not, it makes them appear above the team and petulant. You can’t have a bench clearing brawl if some prima donna decides to stay on the bench. Relief pitchers rarely ever bat. And, if they do, they can expect some sympathy and only straight stuff from their bullpen brethren. Never walk the tying or go-ahead run. Because you can’t score from the dugout.